Need more information about booking Home 6998986 ? 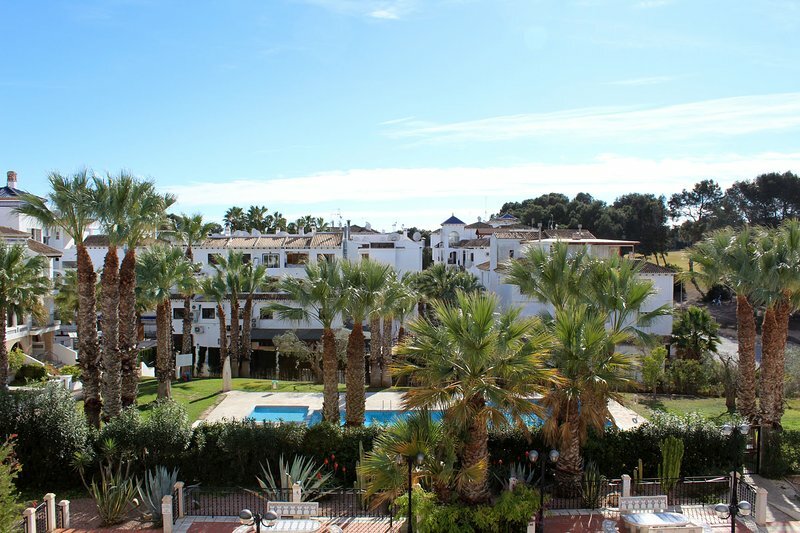 This 2 bed 2 bath apartment is located on the Villamartin Golf complex with all amenities at your finger tips, no need for a car as all is here! The apartment is large & fully air conditioned. On entering you have a spacious living room / dining area to suit all with full UK TV package, Blu-ray DVD Player & Pioneer Midi HI-Fi System. Comfy sofas seating 4 to 5 and the balcony from the living room has beautiful views to the communal pool below as well the golf course. South facing you get the feel of the sun all day. The kitchen is fully fitted to service all needs on holiday or catering for any party you may wish to have. Both bedrooms have single beds which can also be put together if required making a king size. There is a family bathroom fully fitted and the master bedroom has the ensuite shower room. Although part of the Villamartin Golf complex you are far away from the activity but a one minute stroll away and there is a choice of over 40 restaurants and bars as well banks, a grocery store and a doctor surgery! Basically the perfect location for a holiday with the family or golf! Just around the corner in the Villamartin Plaza there is a large choice of restaurants from the local kebab shop to 5 star dining in many of the well know restaurants, we even have one owned by a TOWIE cast member. As well as eateries, there is a wide range of pubs to choose from and entertainment for the kids during the summer months. As well during the summer the community puts on entertainment in the central plaza so step around the corner and watch. Just a perfect place to be. The plaza also has a grocery store, banks and doctor. *NOTE*: PLEASE NOTE ADDITIONAL COST AND OFFERING INFORMATION. There is a local bus service which will take you to the shopping mall and close to the beach, walking the rest. There are also taxi ranks as well. The best way around, should you want to venture out is a hire car with many places locally you can hire one for days or the entire holiday.